Prior to now passive 3D glasses were either to heavy, bulky, horribly overpriced, scratched too easily or just plain low quality throw away style 3D glasses. eDimensional went back to the drawing board to bring you the best value as virtually every manufacturer got it wrong. You may have been to a 3D theater and gotten glasses that were recycled and scratched on the lenses - we decided to double our cost of manufacturing the lenses to make our lenses 2-3 times as thick as theater glasses and we designed them with scratch resistant lenses not to mention we also include a glasses cleaning cloth so there is no guessing on what to use to keep your lenses clean for a longer life. You may have found that your 3D glasses plastic broke after a few uses. We also doubled the cost of our plastic only using virgin top quality plastic that is durable and will bend quite a bit prior to breaking. You may have had 3D glasses that were bulky and too heavy. Our 3D glasses are light as a feather and you will forget that you are wearing them. Don't mistake the light weight for low quality as you would have to try very hard to break them and with proper use they will last virtually forever. Finally you can now get top quality 3D Glasses at the best prices around that are perfect for virtually everyone! PLEASE NOTE: These 3D glasses are passive 3D glasses and will not work with active Shutter glasses applications. eDimensional inc. is a registered trademark. HIGHER QUALITY THAN OFFICIAL LG 3D GLASSES AT A BETTER PRICE! 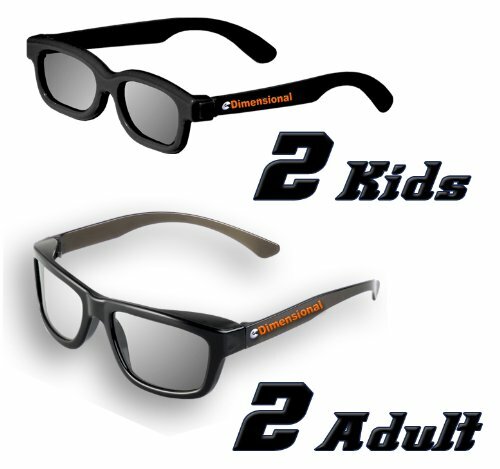 Includes: 4 Premium Black Pairs of 3D Glasses (2 Adult + 2 Kids), retail package, glasses cleaning wipe and instructions! Our ED glasses have higher quality + scratch resistant lenses & stronger plastic for a longer life! Works perfectly with all passive 3D Televisions - SONY, Panasonic, Vizio, Toshiba, LG, Philips and JVC. RealD Matched to work in home or traditional theaters! If you have any questions about this product by eDimensional, contact us by completing and submitting the form below. If you are looking for a specif part number, please include it with your message. DLP Link 3D Glasses, GooDee Ultra-Clear HD 144 Hz 3D Active Rechargeable Shutter Glasses for 3D DLP Link Projectors-BenQ, Optoma, Dell, Mitsubishi etc. SAMSUNG-Compatible 3ACTIVE 3D Glasses. Rechargeable.